Head of the Atomic Energy Organization of Iran (AEOI) Ali Akbar Salehi said his Sunday talks with director general of the International Atomic Energy Agency (IAEA) were focused on Tehran’s programs to develop nuclear propulsion systems under a decree issued by President Rouhani. Heading a delegation, top UN nuclear official Yukiya Amano arrived in Tehran on Sunday morning for a series of high-profile meetings for talks on the process of implementing the Joint Comprehensive Plan of Action (JCPOA), a nuclear agreement between Iran and the Group 5+1 (Russia, China, the US, Britain, France and Germany), which came into force in January. Speaking to reporters after a joint press conference with Amano, Ali Akbar Salehi said his talks with the Japanese official have revolved around Iranian President Hassan Rouhani’s order for reaction to the US violation of the JCPOA, after the US Congress passed a bill extending Iran Sanctions Act (ISA) for ten more years. Following the US measure, President Rouhani ordered the AEOI to develop Iran’s peaceful nuclear program within the framework of the international regulations by designing and manufacturing nuclear propulsion systems in the maritime domain and in cooperation with the Iranian scientific and research centers. 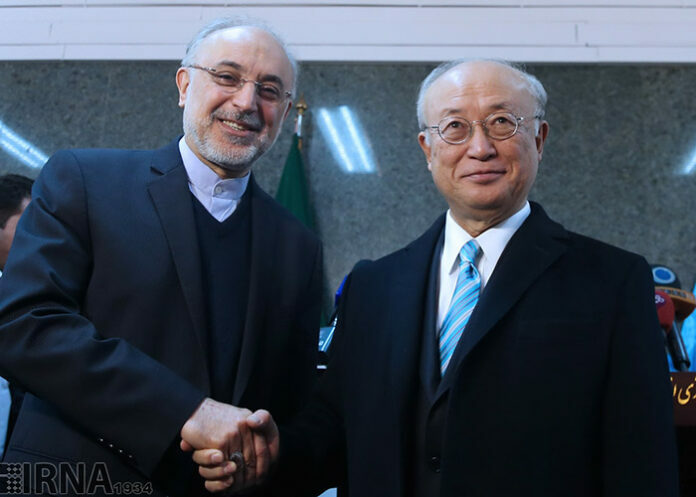 Salehi told reporters that he has discussed the aspects of the presidential order with Amano, as well as Iran’s commitments within the framework of the IAEA’s regulations and the Additional Protocol. Asked about the purity of uranium fuel for the nuclear propulsion systems, Salehi said it is not an easy subject that could be decided immediately, saying his organization will have three months to study the plan. Enrichment of uranium to run those systems may vary from a purity of 5 percent to 90 percent, depending on its type, the purpose and the time available, he explained, stressing that all such activities will be carried out in conformity with the Safeguard Agreements. The Iranian nuclear chief also denied that Amano has passed on a message from the US. He then insisted that the IAEA should remain an impartial and independent body without coming under the influence of any party. It is Amano’s second trip to Iran in 2016. He once visited Tehran in January, days after the JCPOA took effect. The IAEA is responsible for monitoring Iran’s nuclear activities as per the nuclear deal and should also help the country develop its nuclear energy program.